Saxophonmundstück, empfohlen für den Einsatz in klassischer Musik und im sinfonischen Blasorchester. Copyright © 2017 Caravan Mouthpieces. 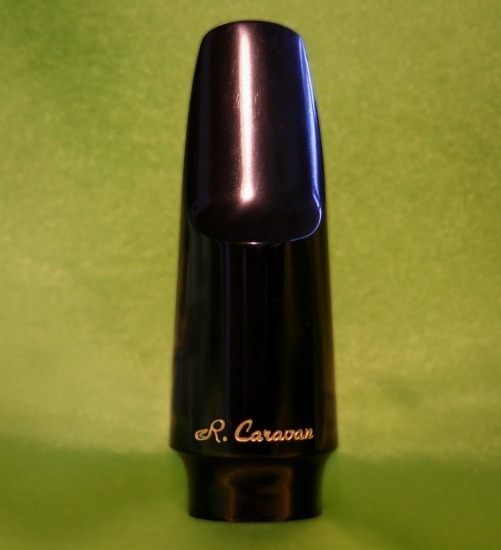 Ronald L. Caravan: „Available for soprano, alto, tenor and baritone saxophones, this mouthpiece represents a modern manifestation of Adolphe Sax´s original mouthpiece design. The „open chamber“ characteristic (no construction in the tone chamber) provides for considerable tonal depth and darkness in quality for „classical“ performance on saxophone, but the tone chamber is also sized to allow for plenty of power and richness compared with older open-chamber designs. The beautifully balanced sound this mouthpiece can produce comes primarily from the deep baffle and round tone chamber that blends smoothly into the bore of the mouthpiece. Wider side and tip rails provide for greater purity in the tone and greater homogenity of color throughout the saxophone´s range.